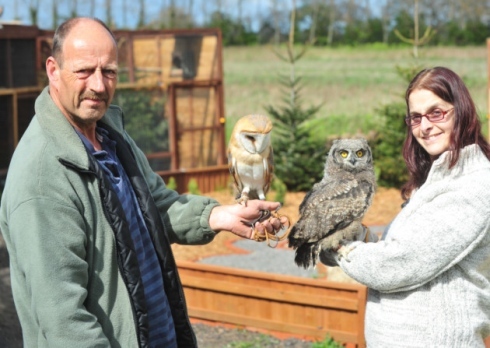 I recently popped over to Fritton Owl Sanctuary to pick up some owl pellets for Emily for Christmas (don't ask!) and I had to try and be sneaky with this as I had the girls with me. 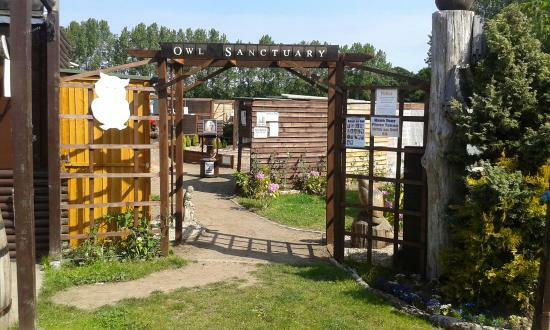 The Owl Sanctuary is situated at the back of Fritton Plant Centre, so I had hatched a plan that we were going there to search for a plant for Grandma. Whilst there I quickly scouted about to see where it was located and with Mollie in on the secret, I made out that I had just discovered it. I got them to wait outside whilst I went in to "ask" whether it was open to look around. In fact I was picking up the pellets. Once I had the pellets safely hidden away in my handbag, I popped back to the girls and told them that we were allowed to have a look and did they want to? Whilst we were looking at the owls we were joined by Louise, she chatted to the girls about the different owls they have, their characteristics and breeds. And she answered endless questions from them about the owls. Each of the owls appeared in good health, with full plumage of feathers and all were alert and perky. Their habitats were clean and spacious, most were in their own enclosures but a couple had two owls together. Most of the owls were pretty vocal too and it was surprising to hear the different calls they made. I always presumed that owls just hoot but some of them were quite different, especially the one that sounded like coconut shells clopping! There was also a cafe (this was closed during our visit) a small garden area and seating area. A display of owl boxes that the sanctuary place out in the wild and information boards. Plus a wooden wishing well for donations, this helps the sanctuary to keep running and to care for the birds. I made sure the girls put a few pounds in each. What a lovely little discovery this place was, the girls have already asked when we can go back! I did notice Redwings Horse Sanctuary and Fritton Lake are all close by so these would make for a good day out, perhaps somewhere to take our friends Here Come The Hoopers when they next visit! Science Fun with The Curiosity Box!